Treasury officials suggested halting the expansion of the national bowel screening programme as an option to keep Health Minister David Clark's Budget 2018 wish-list within the $750 million to $770 million range, newly released documents show. Treasury officials suggested halting the expansion of the national bowel screening programme as an option to keep Health Minister David Clark’s Budget 2018 wish-list within the $750 million to $770 million range, newly released documents show. The advice, contained in a report to Clark and Finance Minister Grant Robertson in early March, was released in a large tranche of Budget documents by Treasury on Thursday. The advice came with warnings of negative outcomes for patients and damage to the Government’s reputation if the rollout did not go ahead. 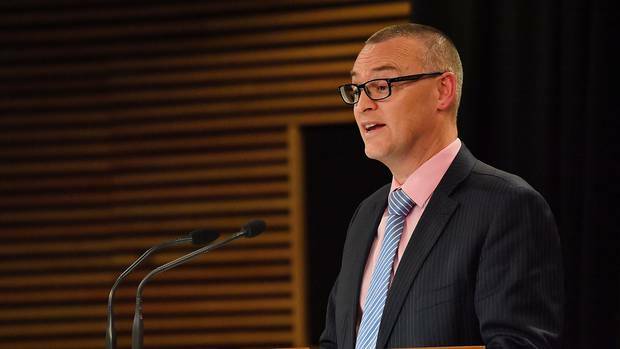 Health Minister David Clark faced making trade-offs in the health budget. The advice was not taken up, with $67.1m funding in this year’s Budget to extend the programme from five district health boards to 10. The Treasury report outlined “key trade-offs” that could be made to keep the health portfolio spend within budget and gave Clark and Robertson four options to achieve it. The report, dated March 15, was prepared ahead of a Budget ministers’ meeting on March 19. It noted that the list of proposed health initiatives totalled $871m per annum, at least $100m a year more than the signalled range. Among the four options was not funding a large portion of initiatives arising from both manifesto promises and cost pressures. They included not funding the expansion of the national bowel screening programme from five to 10 district health boards; scaling cost pressures in maternity care and primary care, scaling DHB cost pressures; and not funding an integrated therapies pilot for young people, a manifesto initiative. While some of the advice around the risks associated with the package, which would have cut the cost by at least $93m a year, were redacted from the report, Treasury spelled out the risks in not rolling out the national bowel screening programme further. “There is a reputational risk to the Government if this cost pressure is not funded and there are likely to be negative outcomes for eligible individuals who would have been able to access screening if the programme had been rolled out as signalled,” the advice said. A spokesperson for Clark said on Thursday a range of savings and reprioritisations were identified, including the phasing of some policies that brought down the overall cost of health initiatives while still allowing the Government to deliver on its priorities. Each year more than 3000 New Zealanders are diagnosed with bowel cancer and more than 1200 die from it. Under the national programme, screening is offered every two years to men and women aged 60 to 74. Once fully implemented it’s expected to detect 500-700 cancers a year. A last-minute funding boost by the new Minister of Health has seen NZNO negotiators give a thumbs-up to a revised pay offer from the 20 District Health Boards.